Ever since our founding more than 20 years ago Superior Closets has been driven to provide the people of Toronto with the highest quality home and office storage solutions utilizing the latest state of the art technology and leading edge design concepts. Our mission is to help you organize and beautify your life by finding a place for everything you have and putting everything in its place. 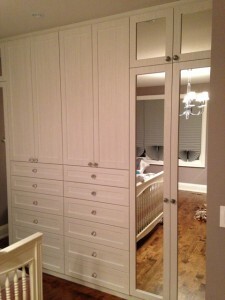 If you are considering the addition of built in wall units for your home or office you can trust that the designers and craftspeople of Superior Closets will see your project through from concept to completion. We have built our reputation on the twin pillars of world class design and quality workmanship, and we have legions of satisfied customers to show for it. With a little imagination and the ingenious utilization of space, built in wall units can serve a variety of purposes and solve an array of storage problems. The custom fit nature of built ins allows them to make maximum use of available space and put formerly fallow areas of your home or office to productive and aesthetically pleasing use. Our smart, attractive and efficient designs can add many cubic meters of storage to your existing space without imposing on or detracting from the normal rhythm of your life. When space is at a premium and your options seem like bad and worse trust the pros at Superior Closets to see through the clutter and find the built in storage system that’s right for you. Whether it’s utilizing areas around your wall mounted TV or fireplace, repurposing an innocuous recess in the hallway for shoe storage, adding capacity along the walls of your stairwell or over a desk, or building out the space over the washer and dryer we’ll take your storage predicament and turn it into a solution that will add beauty and value to your home for years to come. Add substantial storage capacity while enhancing your living space. Blend in seamlessly to the existing architectural motifs of your home. Create new and interesting focal points in spaces you previously thought you knew like the back of your hand. Add quantifiable resale value to your home. Of all the components that make up a first class living space perhaps none has more immediate or long term impact on your experience of that space than a well thought out, well-crafted system of custom made built in wall units. The aesthetic and practical value they add to your life is difficult to put into words but easy to appreciate once you see them in place.